If you’re looking for gate to enclose your driveway, parking lot, storage yard, or any other commercial or residential property, you’ll need a reputable gate systems installation company to help you choose the best gate system for your needs. 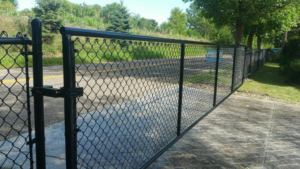 With experience installing a variety of gate systems, from roller gates to swing gates, you can be sure that Twin Cities Fence has the skill it takes to properly install a quality gate to complement your fencing system. As a fencing installation contractor, we install gates to match several materials, including vinyl fencing, aluminum and steel ornamental fences, wooden fences, and galvanized steel and color-coated chain link fencing. Whatever fencing system you might already have installed on your property, or if you’re looking to install a full fence system with a gate as the finishing touch, we’re the team for you. Often times, aluminum or steel gates are the perfect entry point for a commercial or residential property, providing a classic gateway to ensure that there’s limited access to your property. Whether the rest of your property is surrounded by aluminum or steel fencing or not, these gates are often the most effective and professional-looking gates for business and homes, helping to complement your property’s aesthetic while providing an effective means of keeping trespassers out. Any gate that restricts entry to your property adds to the property’s value, and the added measure of security will not be established in vain. Aluminum and steel gates are extremely difficult to climb, break, or tamper with, making them perfect for a home or business that you want to protect. These gates also have the added benefit of being extremely durable, ensuring that when you invest in one gate, you won’t need to replace or repair it every other year. With galvanized steel or aluminum, you can be sure that your gate will outlast weathering and wear. Chain link fences are popular commercial fencing systems, and they are often used on residential properties as well for establishing property boundaries and setting up designated areas for animals and children. If you opt for a fully-enclosed fencing system, you’ll need to finish it off with a chain link fence gate, and we’re here to help you make sure that you get the best chain link gate for your needs. With a chain link fence, you’ll typically see roller gates or swing gates depending on the size and style of your chain link fence. For larger fences or commercial properties looking for a more extensive measure of security, larger rolling chain link gates are usually preferable, as they’re difficult to climb and can cover much more space than a simple swing gate. Similarly, if you’re attaching a chain link gate to another form of fence, of it the opening to which you’re looking to attach your gate is large, you’ll likely need a roller chain link gate to fill the space. With smaller fences, such as around playgrounds and schools, back yards and small side entrances, a swing gate may be more of what you’re looking for. As wood and PVC fence installers, we also install wood and PVC gates to complement your fence’s design. Because wooden and vinyl fences can be very diverse in their style, size, and designs, it’s important that, if you want a gate for your fence, you try to have it installed by whomever is installing your fencing system. However, we’re happy to help you find a gate style and design, made from materials to meet your needs, that will complement and blend in with any fencing system you already have installed at your home or business. We want to make gate installation a quick and painless process, and we’re committed to helping you get whatever PVC or wood swing gate you want to create an access point to your property. When you come to Twin Cities Fence for your gate installation needs, you can be sure that we’ll help you get exactly the gate that you want to offset the style and design of your fence or property. 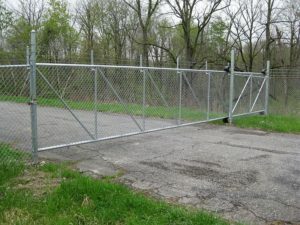 Whether you’re looking for a gate to add aesthetic appeal; increase property value; provide an added level of security; or simply create a boundary to keep your driveway, parking lot, yard, or any other commercial or residential area free of trespassers and wanderers, we have exactly the gate you need. We’ll help you seal off an otherwise complete fencing system, install a gate at an entry point without fencing, and help you choose a gate that matches your aluminum spear top fence, wooden privacy fence, vinyl contemporary fence, steel chain link fence, or any other fencing system you might have. For a free estimate for gate installation, contact Twin Cities Fence at 612-443-1948, or email contact@tcfmn.com. We’ll help you choose the best fencing style and design for your home or commercial property, whether it be a rolling gate, swing gate, or otherwise.